4 Bedroom Detached House For Sale in Braintree for Guide Price £380,000. This versatile family home, has been extended to provide ample family sized accommodation over two floors. To the rear there is a substantial extension which is a blank canvass to develop as you wish. The ground floor offer generous reception rooms and modern kitchen, and to the first floor four double bedrooms and bathroom. The private rear garden, has been landscaped for ease of maintenance, and has raised borders, a corner summer house and a timber shed. Access can be granted to the front of the property via the side entrance. At the front there is a single garage and driveway, as well as an area of front garden which could be converted to additional driveway space if required. The welcoming entrance hallway provides a large and open space as you enter the property. With the stairs leading to the first floor and doors to the ground floor reception rooms. At the front of the property and open plan to the dining room, the main sitting room is bathed in light from the window at the front. A feature fireplace draws the eye as the main focal point of the room. With French doors leading to the garden, the formal dining room was once an independent room in its own right, more recently it has become part of a large open plan reception room which allows the light to flood through the ground floor. There is ample space here for a family sized dining table and chairs. At the rear, the re-fitted kitchen offers a range of eye and base cupboards and counter space. Enough room for all of the white goods and a stainless steel sink unit. There is a pantry style cupboard under the stairs and a door to the garden. This space is part of a later extension that was originally used as an annex with stairs to the first floor, the stairs have now gone and this imposing room is ready to be transformed in to any room you wish. The sellers have considered making this an open kitchen/family room, as the plumbing is already in place. Perhaps with a sky lantern in the roof and a central island, this room could be truly special. Formerly a shower room, the ground floor WC is larger than average and currently houses a WC and sink. The master bedroom is at the front of the property, with a large window facing forward. There are floor to ceiling mirrored wardrobes which are to remain. The second double room is at the rear and forms part of the later extension. There is a built in wardrobe and is too a double bedroom. At the rear you will find this third double bedroom with views across the gardens. The room is located off of an inner hallway which also grants access to bedroom 2. Unusually, the fourth bedroom is also a double, with built in cupboard over the stairs and a large window to the front. The generous size family bathroom comprises; panel enclosed bath with shower over, low level WC and sink. The private rear garden, has been landscaped for ease of maintenance, and has raised borders, a corner summer house and a timber shed. Access can be granted to the front of the property via the side entrance. 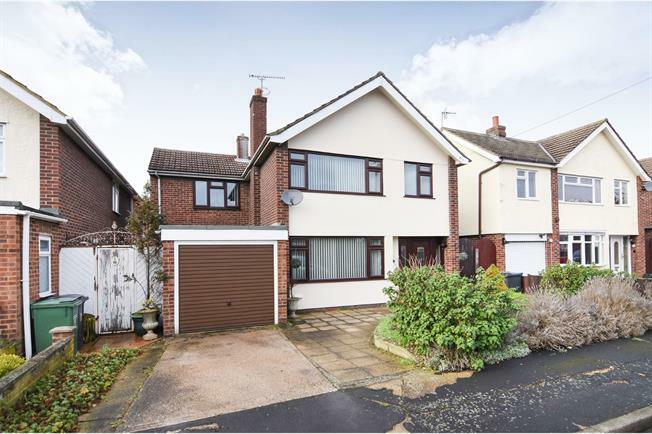 At the front there is a single garage and driveway, as well as an area of front garden which could be converted to additional driveway space if required.